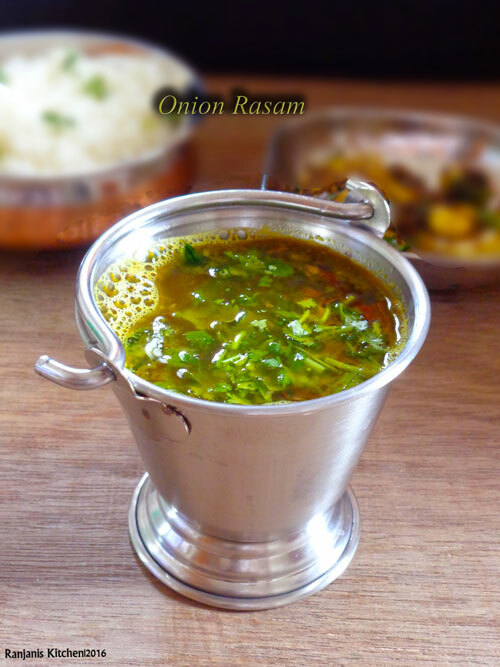 Vengaya rasam – south indian accompaniment for rice. We can make rasam in many varieties. 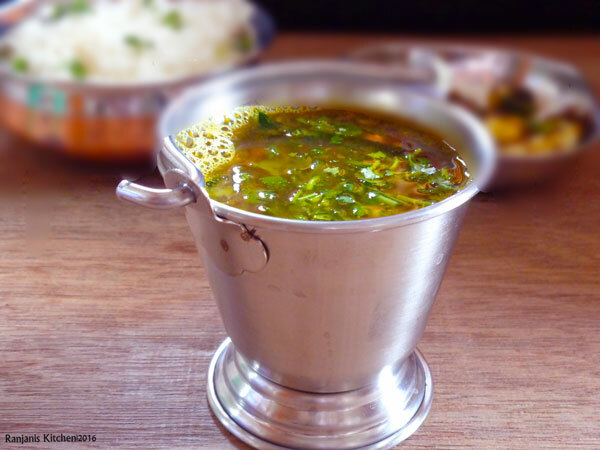 This is one flavoursome and healthy rasam. 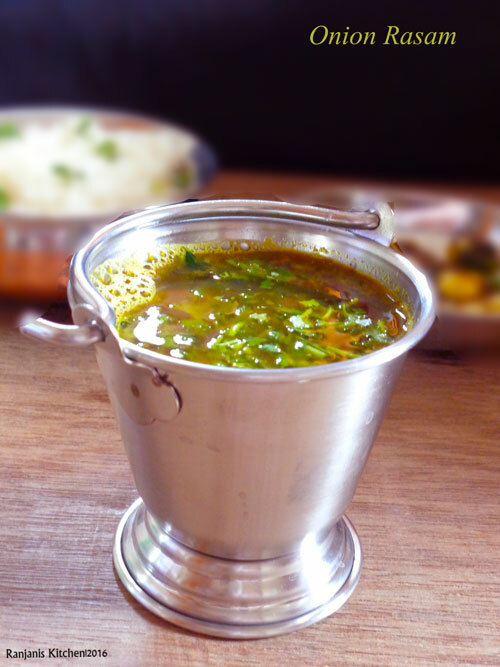 Rasam is the daily dish we prepare along with sambar or pulikuzhambhu or whatever kuzhambhu recipe we prepared. Sometimes simple rasam with pappad makes a complete platter for lunch. If we prepare different varieties in rasam we cannot get bored. Because pepper and jeera in rasam boosts digestion after a meal, so we should take rasam a small quantity in daily basis. Small onions/shallots – 8 to 10 nos. Soak tamarind in warm water for 15 mins, squeeze and extract the juice. In a mixer, coarsely grind the ingredients given under “to grind” and keep aside. Heat a wok, add oil, splutter mustard seeds,then add jeera,red chillies and curry leaves. Add chopped tomatoes, sprinkle needed salt for rasam and saute well till the tomatoes get cooked well. Add coarsely grounded mixture and stir for 2 mins in low flame. Add tamarind water,dal water, turmeric powder and rasam powder to it and mix well. Add some chopped coriander leaves , once it reaches first boiling, switch off the flame and close with plate. Serve after 10 mins with rice and pappad or deep fried curries. You add chopped shallots(small onions) also instead grinding. We can add hing also for flavour. But its optional only. Addition of dal water gives nice taste. If you don’t want you skip it. This rasam sounds delicious ranjani. Have to try it sometime. One of my favorites, looks super yummy..